We offer 3 different approaches for search engine optimization and content marketing, to answer your needs at any stage. This SEO audit provides a deeper look into the state of the website’s performance with search engines and provides you with some starter files and customized reports to kick-off your optimization planning. We will analyze a list of SEO factors for pages in the website (up to 100 pages for large sites). We will provide additional information about specific concerns, if any are found in our research. The SEO audit report will be based on human analysis and results from external SEO authorized tools. We will provide suggestions for your meta tags and alt tags as needed (up to 25 pages for large sites). This option is ideal for a busy CMO or marketer who needs to understand the status of their current website before they pursue detailed implementation. 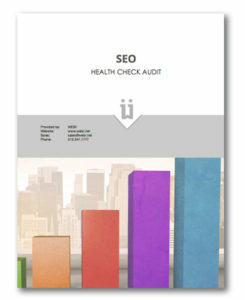 Learn about the SEO Health Check Audit. The SEO setup process not only equips you with analysis and recommendations of an audit, we also implement the changes to your website to take care of the basic structure and give you a good foundation. This is the first step toward a quality search engine marketing effort. This option is ideal for businesses who need professional help from our SEO experts and web development team to tune the website’s basic structure. It’s a great addition to a new web design project! Contact us about an SEO Setup. The SEO Campaign is the most hands-off for you, and the most result-driven option. Our professional team takes care of optimizing web pages, writing content, and implementing strategy. We provide you with extensive updates and reports and remain transparent in our efforts, while focusing on your organic search results. Achieving quality results requires time, so these campaigns are usually 6 months to 12 months for most customers, with additional maintenance options available. Learn more about our professional SEO services.